Here at Anglian Home Improvements, we are always looking at wonderful new ideas, but some of these houses that I am going to share with you are just incredible, and not necessarily a house we would be expecting to improve. Some are stunning, others are interesting and some are just plain bizarre! Which one is your favourite or would you like to live in? Taking advantage of the resources in the local area is a common method when building a house, but this one takes it to a new extreme! 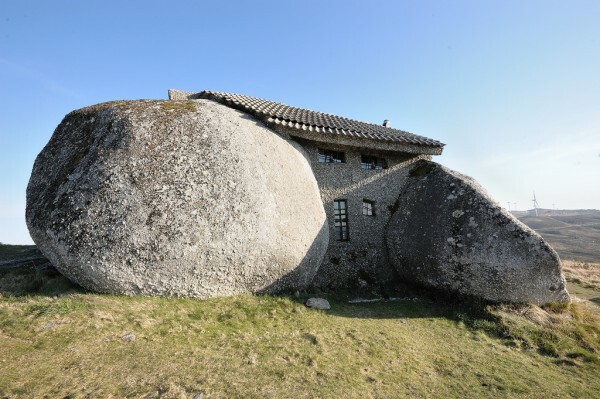 Two rocks in the mountains of Fafe, Portugal have been transformed into walls of this intricate, little home. This home is actually surrounded by wind turbines, so probably harnesses this green energy resource. 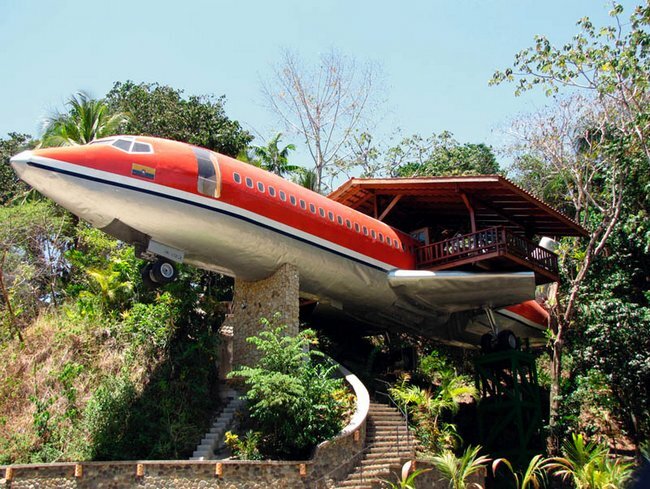 This converted 727 in Costa Rica, in my opinion, looks fabulous perched on the edge of this cliff, overlooking the crystal clear ocean. It is actually part of the Costa Verde resort and is a hotel room offering a warm, cosy retreat with an incredible view. The interior is made up of hardwood in a very modern and stylish design, consisting of 2 bedrooms, a private bath and a luxurious wooden foyer. However, you would not be alone up in this jungle retreat as you may have a few guests who may not have an invite such as sloths, toucans, monkeys and more. I remember seeing this house on Grand Designs years ago and I had to feature it as it reminded me of the Lord of the Rings. The front of the house is made completely of double glazed windows and doors, which are the main source of natural light into the home. 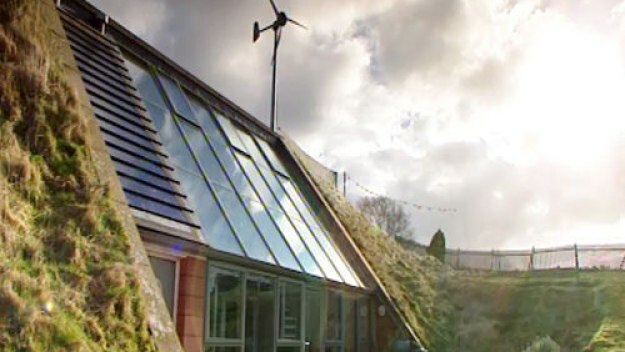 The owners were very focused on their grand design being an eco-friendly home, so building it into a hill meant they didn’t have to install any heating; high levels of insulation was all that was needed to create warmth in the house, along with the masses of earth around them. To reduce their water usage they even had a low-flush toilet installed, designed by conservation specialists. Surprisingly, your toilet accounts for approximately, 30-40 of your water usage! This house was featured on the programme in 2005 and obviously made an impression on me to remember it for 7 years! Do you remember watching this episode? What did you think of the house? No, it isn’t the size of your child’s playhouse. This is a house in Shanghai that is a shrine to Hello Kitty! It’s bright, it’s pink, it has Hello Kitty furniture everywhere. This is a crazy house, but someone loves it very much. 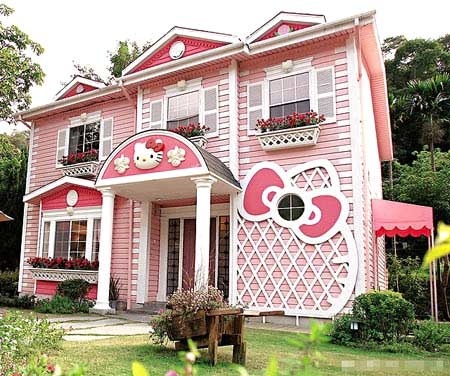 Not sure I could live in this house, but my little sisters would be thrilled to live in this Kitty wonderland. 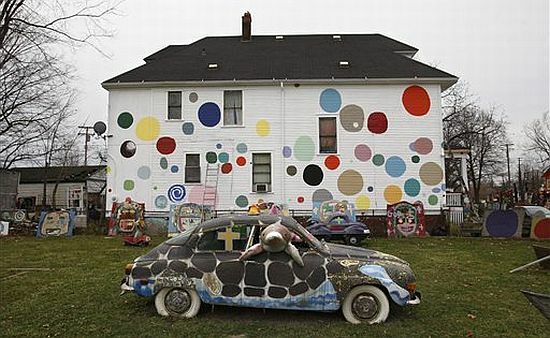 This dotty house looks like Auntie Mable from Come Outside might have lived here with her little dog Pippin, but this is in fact a derelict house that has been used as part of the polka-dot-art movement. The Detroit eco-aware artists are adding colour and life to some of the derelict, abandoned homes in areas where it is not possible for these houses to be resurrected. I think this is a great idea bringing the community together and bringing life to the houses and area that may never be restored to their full glory again. I think, great of an idea this is, I don’t think I would be willing to do this to my home. 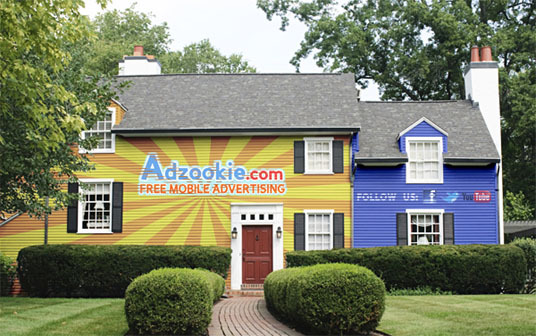 A company called Adzookie will pay your mortgage to turn your home into a giant billboard, which in a time you are desperate for cash, this could be a good way to help ends meet. They will paint the whole house in 3-5 days, the only condition being you keep your house painted for at least 3 months. If you change your mind or decide to cancel after 3 months, they will repaint your house to the original colours. Maybe not such a bad deal? This type of house first started being made between the 60’s and 70’s in Finland, reflecting the events of this period, such as missions to space and the rapid economic growth. 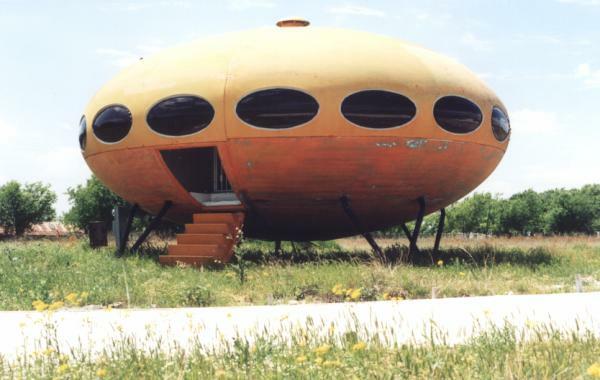 Made from fibreglass, these cylindrical structures resemble UFO’s and I think they would look peculiar no matter where they were put; especially in a housing estate or in a field, they would stand out like a sore thumb. Luckily there were only 100 made. 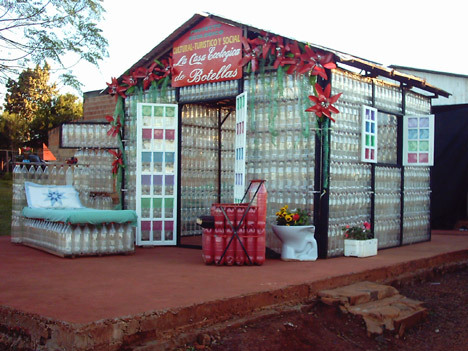 This is an amazing example of recycling, taking regular household rubbish such as plastic bottles, Tetra Pak cartons and CD cases, and turning them into something useful; like a house! Although it is not a huge house, they do have furniture also made from these recycled materials and due to its location in Puerto Iguazu, near Brazil, heating is not an issue. The Santa Cruz family made this wonder as they wanted to prove that what some people may consider rubbish, others will find an innovative new way to utilise the material. I think this is a great, basic house and the Santa Cruz family have done a grand job, proving you can make something out of ‘nothing’. Maybe Ed Sheeran based his song on James May’s giant project? 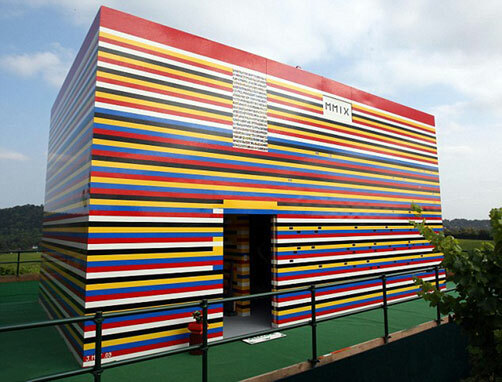 Yes, this 20 foot house was built entirely from Lego even boasting a working toilet and a hot shower! The only downfall of this multicoloured beast was that it was not waterproof, although it was free to a good home; not that anyone collected it, sealing its fate of destruction. 3.3 million bricks were used, not only on the walls, but on a bed, kitchenware, a newspaper, slippers and even a cat. Top Gear presenter May, decided to build this because of his love and passion for Lego, which has been instilled in him since he was young. If anyone could have owned this house, who do you think it would’ve been? Would you like to have lived in this house (if it was water-tight obviously)? So this is my collection of weird, wonderful and bizarre homes, but what do you think of my selection? Have you seen any you would like to share? Send your pictures in to [email protected] and they will be featured in a future blog!